OMAFRA field crop staff in collaboration with the Grain Farmers of Ontario (GFO) and members of the Ontario Agri-Business Association (OABA) have completed the annual Provincial corn ear mould and mycotoxin survey. 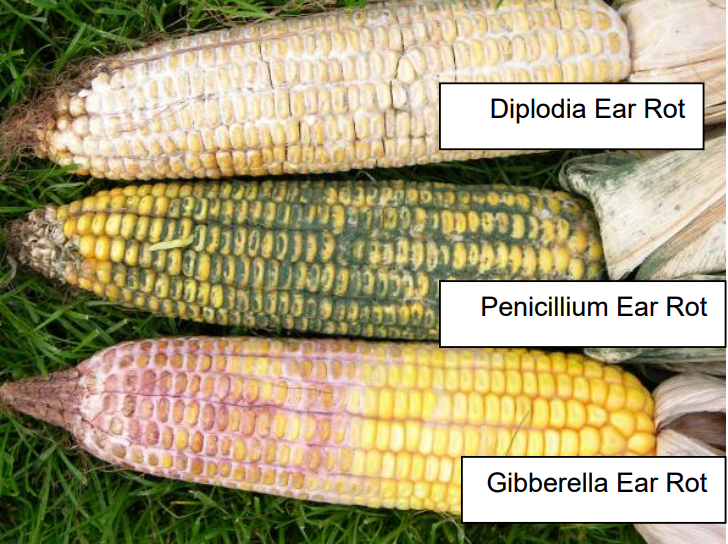 Corn ear moulds such as Gibberella and their corresponding mycotoxins occur every year in Ontario. These mycotoxins, particularly vomitoxin (DON) produced primarily by Gibberella/Fusarium ear moulds can be disruptive when fed to livestock, especially hogs. The 2018 survey found 60% of samples tested low (<2.00 ppm) for DON. As we have seen in previous years when environmental conditions were favourable for disease development, the Ontario grain industry has been prepared and able to process corn with minimal impact. From September 21 to 28, a total of 146 corn ear samples were collected from across the province and rated for visible ear mould infection (Figure 1). Five consecutive ears were collected from four random locations throughout a field and placed into high temperature driers as soon as possible after collection. Pictures were taken to document the presence of moulds, insect and bird feeding damage. Dry ears were shelled and mixed through a sample splitter and delivered to SGS Agri-Food Laboratories in Guelph for vomitoxin (DON) analysis. Figure 1. Corn ear moulds which can be observed in Ontario. From the initiation of the annual vomitoxin survey in 2011, general survey samples from grower fields and samples collected from non-harvested border rows of Ontario Corn Committee (OCC) trials have been collected and reported together. In 2018, OCC border samples (4 hybrids/location) exhibited higher levels of ear mould and DON concentrations than the grower samples, and may reflect differences in susceptibility of sampled hybrids, planting date, incidence of insect/bird injury or environments relative to grower samples. Results for both grower samples and OCC border samples are shown separately in Table 1. Overall, visual mould symptoms were more apparent this year and vomitoxin analysis revealed a greater incidence of samples with elevated DON concentrations (Table 2). While 60% of samples tested below 2 ppm, it is important to remember that growers should remain vigilant and be aware of management options in those fields with higher ear mould and DON concentrations. Ear moulds and mycotoxins occur every year in Ontario. In years when environmental conditions were favourable for disease development, the Ontario grain industry has been prepared and able to process corn with minimal impact. Maps showing the distribution of samples and their corresponding DON levels are presented in Figures 2 and 3. Table 2. Vomitoxin (DON) results from the previous seven Ontario vomitoxin surveys. Figure 2. Corn ear mould and vomitoxin (DON) survey sampling locations and results from grower fields in 2018. Figure 3. Corn ear mould and vomitoxin (DON) survey sampling locations and results from OCC border rows in 2018. Ear feeding by pests, particularly western bean cutworm (WBC), and in a few cases birds can present an opportunity for greater mould infection. In past years feeding damage appeared to be a significant contributor towards elevated DON levels in survey samples. In 2018 survey samples, ear damage from pest feeding was very minimal, significantly lower than the past several years. This is consistent with WBC scouting observations and trap counts during the 2018 growing season which suggested much lower pressure. While WBC trap counts were lower in general, a majority of corn also tasseled prior to peak moth flight which may have deterred egg laying in corn fields. Late season corn earworm (CEW) damage in some fields particularly southwestern and eastern Ontario could have contributed to increased ear mould incidence and DON production. Particularly in later planted fields that were most attractive to CEW. The importance of collecting a representative sample cannot be emphasized enough, since 90% of the variability associated with mycotoxin test results comes from incorrect sample collection. While taking a sample from the top of a storage bin, truck or combine may be easy and convenient, mycotoxins are rarely distributed evenly in a load of corn. If the sample is to come from a bin, truck, V-box, or other stationary load of corn, a sample probe is recommended. Although 10 probes are recommended, 5 probes will do if necessary. Mix the grouped sample and take a representative sample from this pooled sample. If you are dealing with a moving stream of grain, either use a diverter or randomly collect cupfuls of grain. Regardless of how the sample is taken, it must be processed quickly. Ship or deliver the sample promptly. The longer the sample sits around the greater potential of an inaccurate results. This survey does not fully capture all regions of the province, and results can vary locally from field to field depending on hybrid, planting date, insect feeding, rotation, residue levels, fungicide practices and moisture. These results may not fully capture what is occurring in your fields, and therefore monitoring is recommended. Timely harvest is important. Leaving diseased grain in the field allows the ear rot fungi to keep growing, which will increase the risk of mouldy grain and mycotoxin contamination since most ear rot fungi continue to grow (and potentially produce mycotoxins) until the grain has less than 15 percent moisture. In severely infected fields, growers should consider harvesting grain at higher moisture and then dry it to less than 15 percent to minimize further mycotoxin accumulation. If a field contains a significant level of ear mould, collect a representative sample prior to harvest and have it tested for mycotoxins before storing the grain or feeding it to livestock. If necessary segregate the harvested grain from your other corn. A lab test is often the only reliable way to definitively determine mycotoxin presence and levels. Harvest and dry as quickly as possible, especially susceptible hybrids. Mould and mycotoxin development ceases when grain moistures are below 15%. If insect or bird damage is evident, harvest outside damaged rows separately. Keep and handle the grain from these rows separately. Adjust harvest equipment to minimize damage to corn, and to remove smaller end kernels or those that have been damaged from mould or insect feeding. Clean corn thoroughly to remove pieces of cob, small kernels and red dog which may be infected. Clean bins before storing new grain and cool the grain after drying. If possible, segregate corn based on vomitoxin content to help match end use. Check stored grain often for temperature, wet spots, insects and mould growth. For grain with elevated mould content, consider marketing as soon as possible. Avoid long term storage where possible. Exercise caution when handling or feeding mouldy corn to livestock, especially to hogs. Pink or reddish moulds are particularly harmful. Test suspect samples for toxins. Work with a nutritionist to manage vomitoxin levels in feed. Preventing ear rots and mould can be difficult since weather conditions are critical to disease development. In years when environmental conditions were favourable for disease development, the Ontario grain industry has been prepared and able to process corn with minimal impact. A few things to consider for 2019. Hybrid selection is important but remember although some tolerant hybrids are available, none have complete resistance. Growers are encouraged to discuss with their local seed supplier, what ear mould tolerant hybrids are best suited for their operation. Crop rotation can reduce the incidence of ear rots, while several foliar fungicides aimed at suppressing ear rots have also been registered. Cultural practices such as tillage have been shown to have limited success in preventing ear and kernel rots. Agricorp customers with mould issues are encouraged to immediately contact Agricorp at 1-888-247-4999 and report damage. We would like to thank the Grain Farmers of Ontario and SGS Agri-Food Laboratories in Guelph for their support of this survey and analysis as well as the Ontario Agri Business Association (OABA) and its members for their interest, support and participation. Sincere thanks to all of those who helped assist in the co-ordination and collection of samples: Agris Co-operative, Benjamins Agronomy Services, Holmes Agro, Lockie Farms Grain Elevator, MacEwen Agricentre, Maizex Seeds, Millstone Crop Services, Parrish and Heimbecker, P.T. Sullivan Agro Inc., TCO Agromart, as well as the several corn producers and OMAFRA field crop staff who were involved. The 2018 survey marks the second year of transition towards more collaborative sampling with industry partners. As part of this transition, some regions of the province may be under represented. We would like to work with additional partners to better represent these areas in the future. Good Mycotoxin Test Begins With A “Representative” Sample!